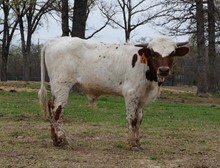 A Cowboy Tuff Chex son that is really growing the horn. He is out of the bull producing cow, Field of Pearls, that now has three 80" sons. Tuff Stuff reached 85" by 3 1/2 and should get to 90".